Two series really jump out at me when I think of books that I enjoyed when I was younger. One was Anne of Green Gables Series, by L. M. Montgomery and the other was the Cutler Series by V.C. Andrews. I enjoyed the Anne of Green Gables books in grade school, I really LOVED these books. Let me tell you, long ago, one of my sisters borrowed my series. Of course, she LOST one of the books! I'd been mad about this for just shy of two decades...LOL, hopefully that didn't give my age away! :-) Anyway, I finally got over it as I bought the missing link on eBay! I remember reading V.C. Andrew books in middle school. I must have read at least four or five of her series before I got over it and moved on to something else. With some of the content in those books, I probably shouldn't have been reading them in the first place, but oh well! :-) I recall the Cutler Series being my favorite! I recently saw that the publisher still has ghost writers writing under V.C. Andrews name, which makes me mad because they are really veering away from the writing style which was Ms. Andrews. V.C.Andrews name on YA Urban Fantasy?!?!?!?! A disgrace! Share with me! What were your favorite childhood book series? 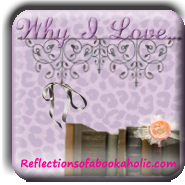 Check out some of my past Why I Love Wednesdays! I loved VC Andrews as well, but I preferred her Flowers in the Attic series. I was also a huge fan of the Trixie Belden Mysteries series. She was a more hip, up to date version of Nancy Drew. I enjoyed the Great Brain series too.